How to Dry Herbs in the Microwave. 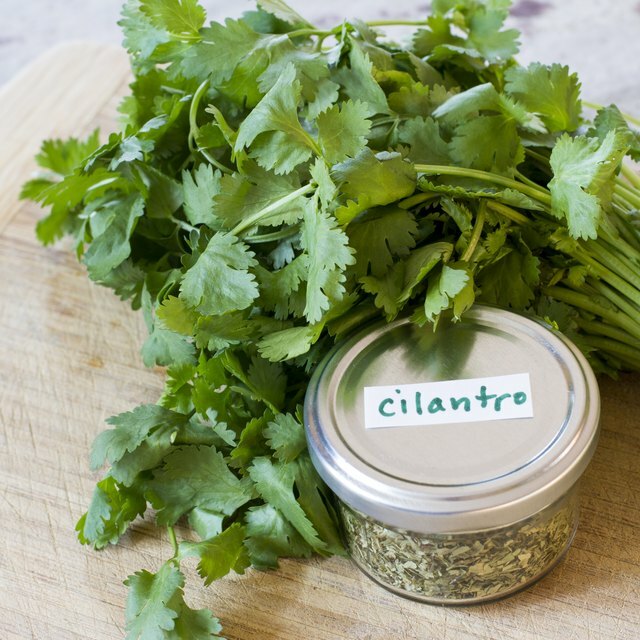 Preserve herbs you harvest from your garden and use the herbs throughout the year by drying them in the microwave. Use this quick and easy method for small batches of herbs or if you lack the space to dry herbs with traditional methods. Purchase inexpensive, thin, white paper plates from the local grocery store. Select dessert plates over dinner plates, if possible. Harvest herbs from the garden. Wash them in cold water and allow the herbs to dry. Remove leaves from stems. Place a small amount of dry herb leaves on a paper plate, about the amount that fits on a paper dessert plate. Place two paper plates on top of each other if the herbs are too heavy for the paper plate. Place herbs in the microwave and set it on high for 60 seconds. Push "Start." Check herbs after 60 seconds. Microwave cooking times vary. See if the herbs are dry and easy to crumble. Microwave the herbs for another 30 seconds if they are not sufficiently dry. Repeat microwaving for 30-second time periods until herbs are dry and crumbly. Store the dry herbs in an airtight plastic bag. Squeeze the plastic bag to further crumble the dry herbs. Place the bag of herbs in a cool, dark storage area. Repeat Step 2 to Step 4 until you dry all of the harvested herbs. Frequently replace the paper plate you use to dry herbs with a fresh paper plate. The paper plate absorbs moisture from the herbs.